This corrosion resistant Bobrick soap dispenser dispenses commercially marketed all-purpose hand soaps. Satin-finish stainless steel. 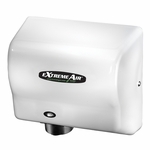 The stainless steel, recessed mounting box contains a soap refill window and has a 90 degree return, concealing a flange. Capacity: 45-fl oz (1.3-L).